BLO = back loop only. Work each stitch for the round in the back loop of the stitch. This will create a small line along the outside of the jar. V-Stitch = dc, ch 1, dc in the same stitch. 2 1/2” across after round 3 for pint jar cozy, 3 3/4” across after round 6 for quart jar cozy. 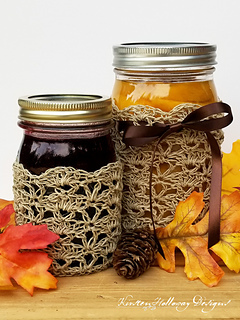 When followed as written: laid flat, pint jar cozy will measure 5” tall by 4 1/4” wide, quart jar cozy will measure 6 1/2” tall by 5” wide. -This pattern is easy to follow, however since it is made with hemp, I’ve labeled this as an intermediate pattern. 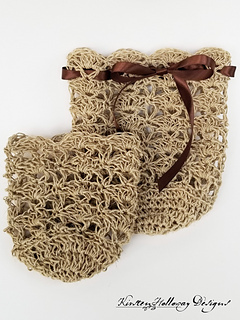 It would be possible to make these using sock yarn, if you do not feel comfortable working with non-traditional materials (hemp) just yet. 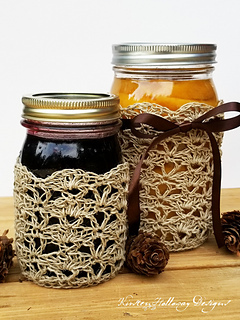 -Because hemp is not stretchy, it is very important that you crochet loosely so these will fit over the jars. I tested mine on my jars every few rounds as I went along. You may find it beneficial to do that as well, especially if you have not worked with hemp before. If all else fails, don’t be afraid to go up a hook size or more.